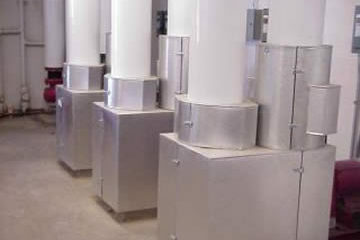 The pipe insulation on the chilled water and heating water is 1-1/2″ thick fiberglass with ASJ SSL. It is covered with .020 white PVC jacketing. 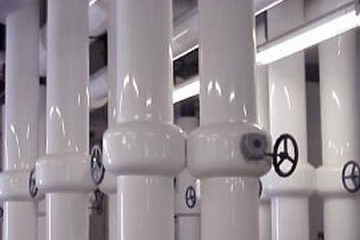 The valves have 1″ closed cell rubber with white PVC covers. The pumps have removable covers made with .032 stucco embossed aluminum with suitcase latches pop riveted in place. The victaulics also have removable covers on them. The insulation was 1″ closed cell rubber glued to the inside of the covers.